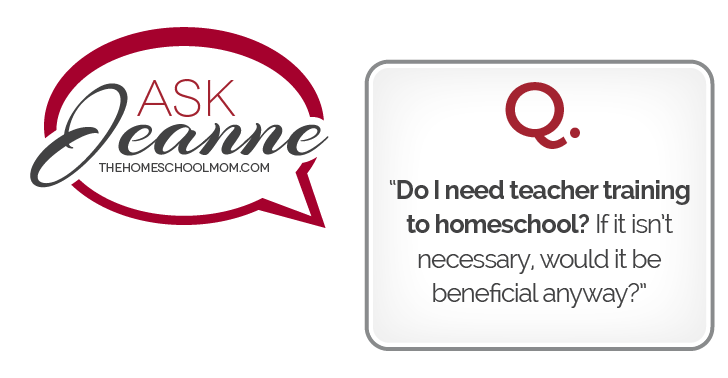 You are here: Home / Blog / Ask Jeanne / Ask Jeanne: Do I Need Teacher Training to Homeschool? Nope! You don’t need teacher training to homeschool. You don’t need teacher certification; you don’t need an education degree; you don’t need even a few college courses in education. In fact, it might surprise you to hear that current and former public school teachers who homeschool their own kids frequently find some aspects of their teacher training and experience to be a disadvantage! That’s because home education is distinct from school, and teacher training prepares people to teach school. Sometimes, the more training people have, the harder it is for them to take advantage of the benefits of homeschooling. It’s not just school teachers who have trouble with the paradigm shift; it can be anyone who did well in traditional school herself. This can lead to a belief that following the school path with traditional textbooks and a school schedule and tests and quizzes—but doing so at home—is the formula for homeschooling. And the thing is, some people do have kids who learn well with that approach. We homeschoolers even call it “school at home,” and it can work. But many of us have kids who do better with other approaches, or at least additional approaches, mixed in. To make space for these unique approaches to education, parents often need to go through a process we call parental deschooling. The joke is, it takes twice as long to “deschool” if you were ever a teacher or a straight A student yourself. Now, the thing is, some education courses that focus on truly up-to-date scientific information about how children learn could be positive for you or anyone interested in homeschooling. Unfortunately, public education in the United States is not actually based on the most up-to-date information about learning. In my opinion, education policies are more impacted by “what we’ve always done,” behaviorist principles, politics, and business considerations than by what we know about how people learn. The problem is that some of what prospective teachers learn and new teachers have to focus on is classroom management, public education policy, common core standards, and moving a class through grade-leveled curriculum. Some education degrees are far more innovative, of course, and particular courses might give you insight on wonderful topics like children’s literature and pedagogy. While I’ve emphasized the other side of things, I do have teacher friends who don’t feel hobbled by their education classes in homeschooling; they are able to make useful connections between their education courses and teaching their own kids. That said, there are wonderful opportunities for parents to become knowledgeable about home education in the homeschool world through conferences and conventions, books, homeschool organizations, and mentors. Our own website has great resources on How to Choose a Curriculum and How to Get Started Homeschooling. Parents don’t have to spend time or money on teacher courses to prepare for a classroom experience that is not that relevant to helping kids learn at home. I am thinking to homeschool my 7th grad soon 8th grader next september of this year. what do i need to know about the subjects i have to teach him? Please visit our Homeschooling 101 articles to get more information on getting started with homeschooling. What you will help your child learn could be based on what your local school division would teach in 8th grade. Many school divisions have courses listed on their website, and you could see what the usual courses are for 8th grade. Another option would be to look at homeschool curricula and see what is commonly presented in 8th grade. Another option would be to teach him “where he is.” For example, although some students are taking algebra in 8th grade, others need more work on pre-algebra. Homeschool parents can decide which subjects their children learn. In fact, some people do not even divide the learning into subjects at all, which just tells you there are some unique ways to homeschool you can learn about yourself! Ideally, you are helping your child learn the level and the subjects that will help him prepare for college or work. One side note: some 8th graders do take classes that count as high school credits, typically math or foreign language. Be aware that there are special circumstances affecting homeschooling high school courses if a student hopes to graduate from a public high school in the future. Please read our article about homeschooling high school for more information. Good luck! I loved homeschooling my boys when they were in 8th grade!